Once again, I faced the dilemma of whether to purchase a Travelzoo voucher or not. 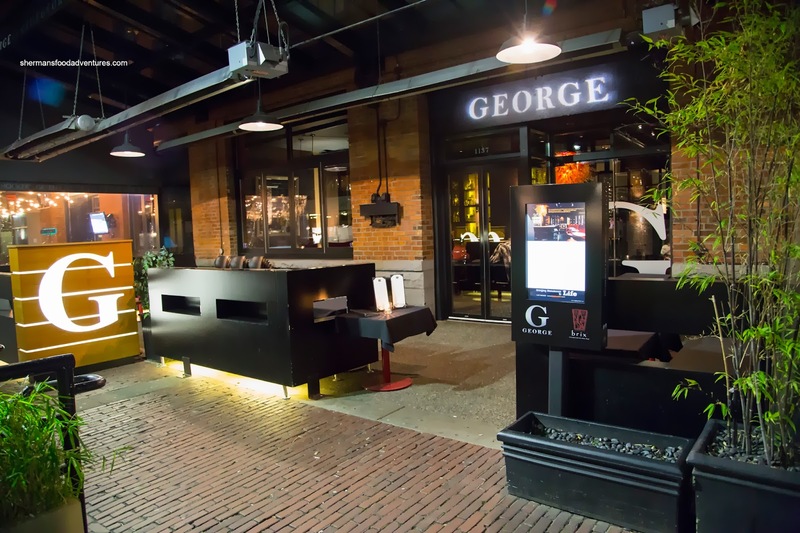 This time, it was for George Ultra Lounge in Yaletown. With a trendy location and chic decor, the reviews seem to indicate that it was form over function. Ultimately, I decided to buy the voucher anyways because George shares the same kitchen as Brix upstairs. And really, isn't Brix considered an above-average restaurant? Besides, I need to see for myself and since Miss Y was interested, how could I pass it up? 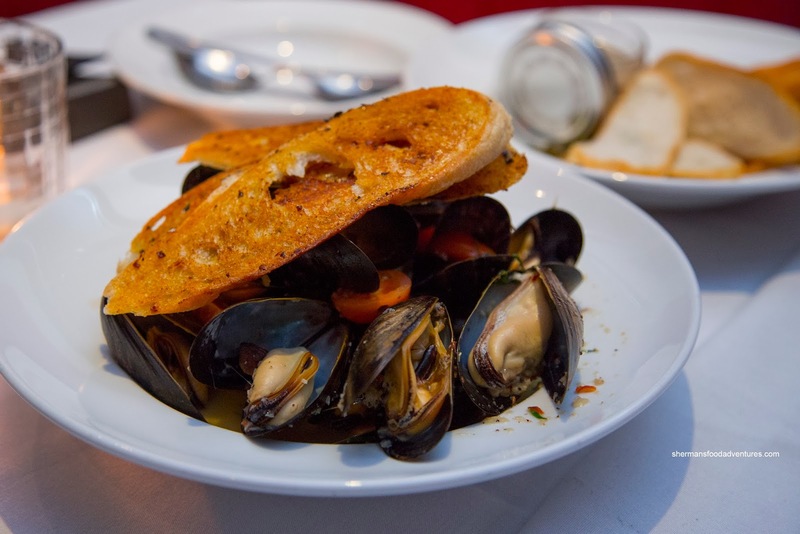 We began the meal sharing 2 appies including the Fresh Mussels with house-made bacon, cherry tomatoes, white wine garlic broth, fresh herbs and chili maple toast. Large and buttery soft, the mussels were flavoured impactfully by the savoury and zesty broth. There was a noticeable level of spice as well as an appealing saltiness from the bacon. 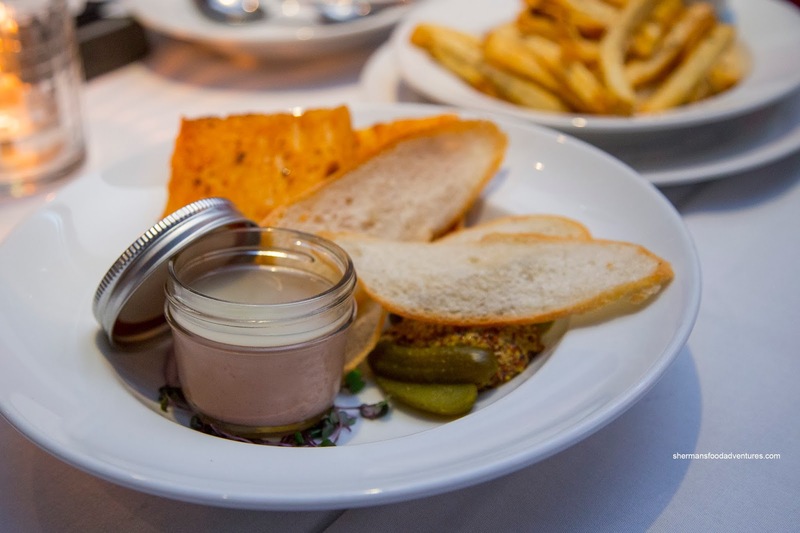 Next, we tried the Duck Parfait Pate with gherkins, grainy mustard and grilled toast points. Beyond the thin layer of duck fat, the pate was creamy and sweet. It was nicely accented by a purposeful amount of brandy. We particularly enjoyed using the garlicky grilled bread with a dollop of grainy mustard as it featured many different textures and flavours. 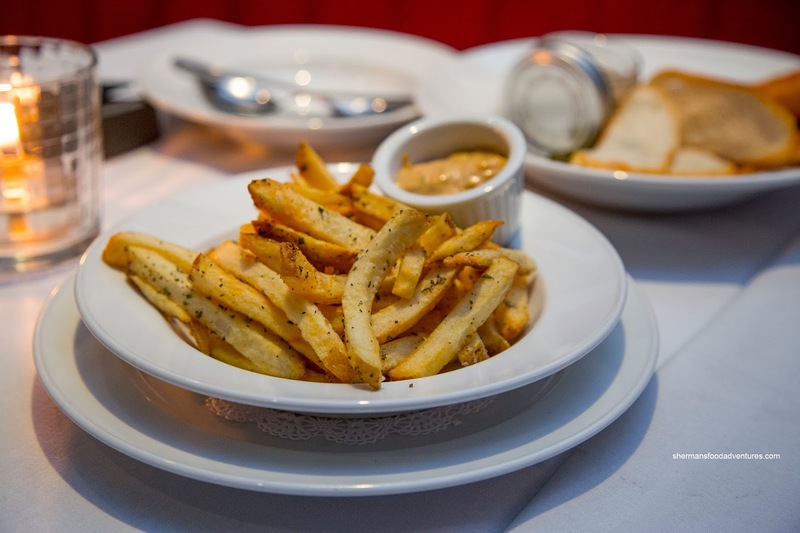 Surely, we couldn't have had the mussels without a side of Frites with truffle and Parm. As it turned out, this was an excellent decision as the house-cut frites were delicately crispy with plenty of airy potato goodness inside. They were well-seasoned and despite my efforts to save my appetite, I kept eating them. 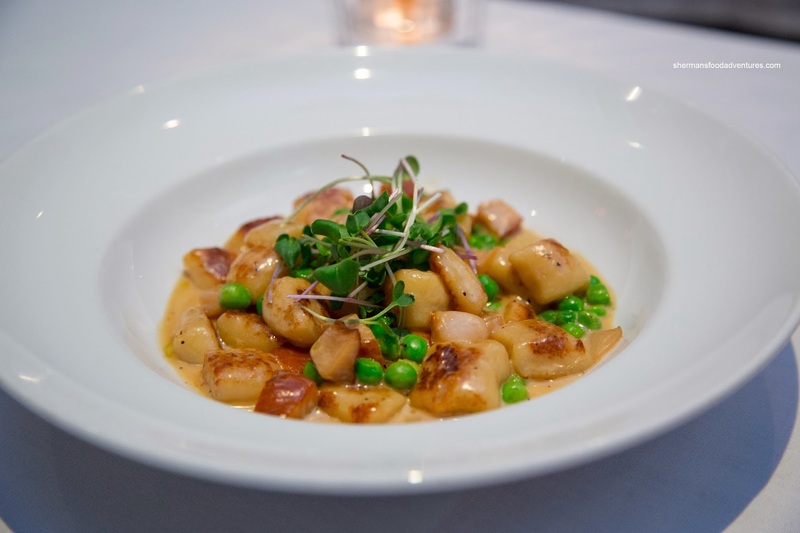 For our mains, we shared the Smoked Sablefish Gnocchi with green peas, white wine cream, local micro greens first. As much as we were concerned that the sablefish would be overwhelmed by smoke, it turned out beautifully soft with just enough flavour. The gnocchi was soft while retaining a bite and best of all, an appealing browned exterior. Therefore, the combination of smokiness, caramelization, sweet peas and creaminess made for a composed dish. Next, we sampled the Duck Breast with Maple bourbon honey glaze, freeze dried mandarin, roasted local root vegetables and apricot gastrique. We liked the rendered fat, but the skin could've been crispier. The properly prepared duck was tender enough with some chew. 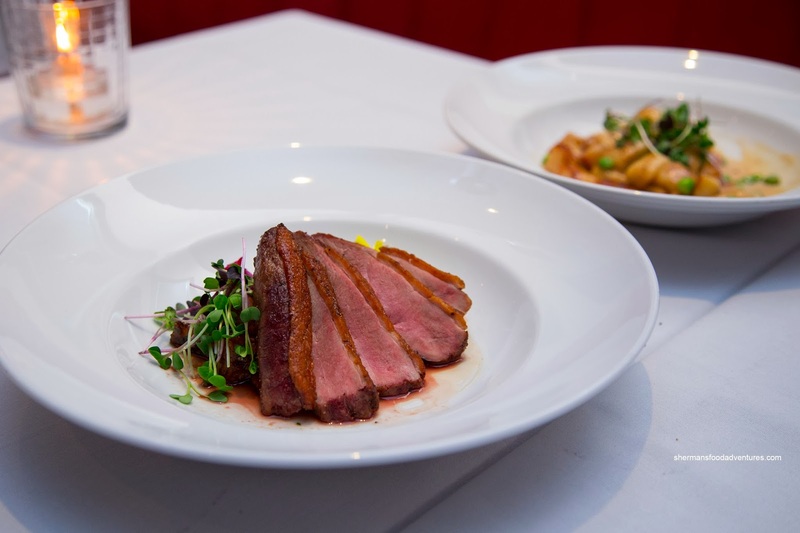 We thought the natural flavour of the duck was sufficient, hence, the overly sweet gastrique was not really necessary. Although we were pretty full, we still had 2 desserts beginning with the Chocolate Mud Cake. 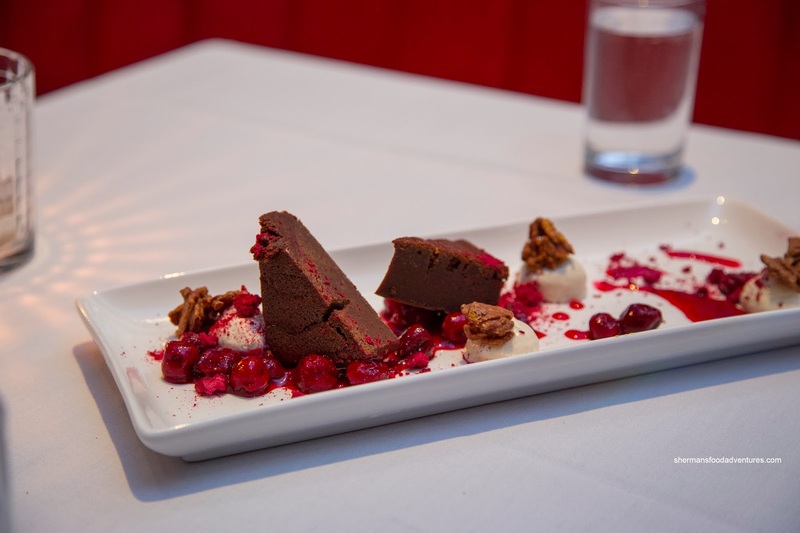 It was accompanied by freeze-dried raspberries, cherries and chocolate clusters. The cake was firm, dense, a little dry and bittersweet. The sweet and tart cherries were a good compliment. 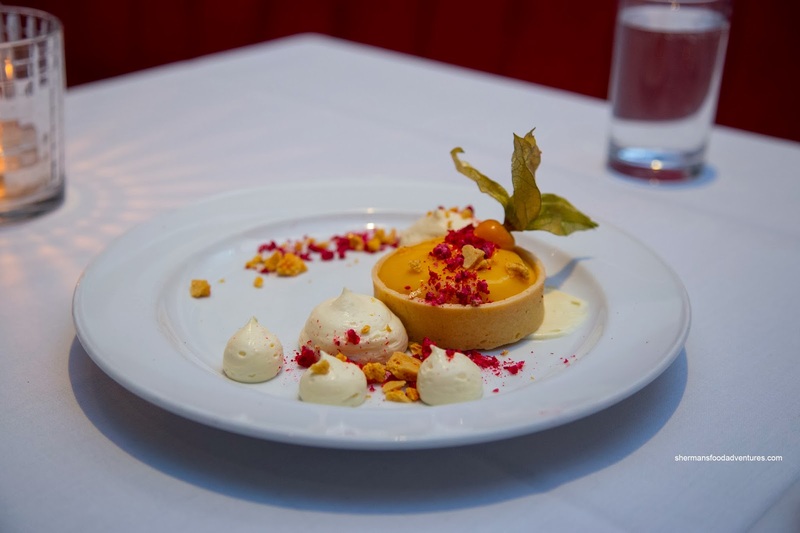 We really liked the Passionfruit Tart with freeze-dried raspberries and honey crunch. The tart shell was firm, yet a bit pale. The filling was smooth and creamy with only enough sweetness. We liked the balance from the tartness. In the end, we did not regret buying the Travelzoo coupon because the food at George exceeded our expectations. What impressed us the most was the genuine and accommodating service from Kim. It only further enhanced our dining experience. We went there for the Dine Out menu and it was great. But I think the standout here is the bar program. Really inventive drinks that also tasted great.